"Absolutely the best banana bread in the universe! The crust on most recipes is dry because the pan is buttered and floured... but the crust becomes the best part when the pan is buttered and cinnamon-sugared!" Preheat oven to 350 degrees F (175 degrees C). Generously grease a 9x5-inch loaf pan with 2 teaspoons butter. Mix 1 tablespoon of sugar with 1 teaspoon of cinnamon in a small bowl, and pour the mixture into the buttered pan. Swirl and tap the pan to distribute cinnamon-sugar all over the inside of the pan, up to the rim. In a bowl, whisk together flour, baking powder, salt, 1 teaspoon of cinnamon, and the nutmeg. In a large mixing bowl, beat 1/2 cup of butter with 1 cup of sugar until creamy; beat in eggs, one at a time, until thoroughly incorporated. Stir in the mashed bananas and milk. Mix in the flour mixture just until thoroughly moistened (a few lumps are fine), and scrape the batter into the prepared loaf pan. Sprinkle the top of the batter with 1 more teaspoon of sugar. Bake in the preheated oven until a toothpick inserted into the center of the loaf comes out clean, about 1 hour. Let cool in the pan for 10 minutes before removing to finish cooling on a wire rack. 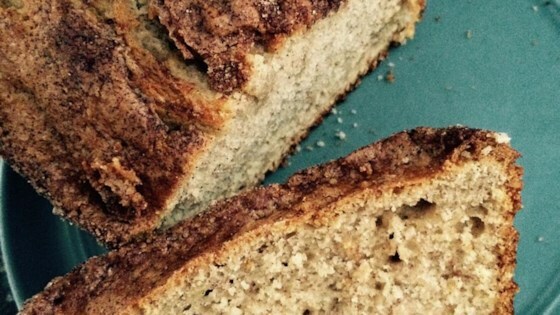 This is a wonderful banana bread recipe! So moist and full of flavor. Plus the cinnamon-sugar crust gives it a sweetness that I haven't tasted in others. Great recipe without the baking soda. Dropped the sugar down to 1/2 cup, used whole wheat flour and used 1/4 Torchbearer's Mango Papaya Sauce. Came out moist with half the sugar. Easy and delicious! Love the spices. This is now my go-to banana bread recipe.